As you may know, I love movies. I don't just love to watch movies, but I also love to talk about them, analyze them and I've even considered starring in them (if anyone would have me). Movie watching is my go-to pastime. And even though ticket prices have escalated into the ballpark of near crazy, I'll still shell out $10 for a twist-filled drama, a high-voltage action flick, or a side-cramping comedy. At the same time, I also enjoy a good book. I'm partial to mysteries, but anything that can hold my attention with the written word will suffice. Two of my favorite books are written by Dostoevsky and Voltaire, but I'm much more of a movie snob than a book snob. Sometimes the movie world and the book world collide. The marriage between the two is not always happy and fruitful, but it usually opens discussion to determine which of the two mediums portrayed the story in the best light. So here is the Oh to Be a Muse movie/book rundown. This movie takes place a bit in the future in a world where a virus has taken over mankind turning humans into vampires. The few humans that are left are either being farmed for vampire sustenance or are hiding out. The main characters are portrayed by Sam Neill (the head honcho vamp who owns the company that farms humans); Ethan Hawke (the lead vampire scientist who searches for a human blood substitute since human resources are depleting); and Willem Dafoe (the man with the answers--who, in any other movie, would have been the crazy old neighbor who is not allowed near children). To really enjoy this film you have to go into it with an open mind. Love for vampires and vampire-related movies will definitely help. The Twilight franchise is not considered in this proclamation. The movie entertains from start to finish even if it lacks some consistency. Neill is very believable, and Hawke's portrayal reminds you that he is a diverse actor who can play more than Pip (Great Expectations) and that guy in Reality Bites. If you can get past the few plot holes that are undeniable, then you'll like this movie for what it is: a scary vampire flick that delivers on the blood and gore. I'll preface this by saying that five minutes before the movie I turned to Ari and said: "This is about the Bible right?" In which Ari replied, "No, I don't think so." I'll now preface this review by telling you that yes, this movie is, ultimately, about the Bible. A man named Eli (Denzel Washington) travels west in search of a place to bring his well-guarded book. 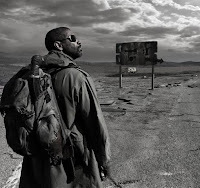 Another movie that takes place in the near future, The Book of Eli is set in a place where it seems the sun took out its anger on the world by scorching everything and burning all the resources. Some people were even left blind because of the UV rays. On his path, Eli comes across a range of people: those who are just looking for food and water; those who aren't keen to outsiders; and those who want to snack on you for breakfast, lunch and dinner (no idea why cannibalism has become so popular in movies lately). Gary Oldman's character is in search of the book that Eli has and basically spends the movie obsessing over this. His malevolent quandary leads him to barter Mila Kunis for a chance at the book, in which he discovers is in Eli's possession. The best thing about this movie is the scenery in the beginning, the action in the middle and the revelation (ha) at the end. Here is where everything gets interesting. The big difference with this movie is that not only did I see the movie but I also read the book. Actually, I started the book on a Tuesday and saw the movie on the following Friday. I haven't read a book that quickly in years--but I'll get into the book in a few. Oh Marky Mark. I will always have a soft spot in my heart for Mark Wahlberg and not just because of Boogie Nights or "Good Vibrations," but because of his overall ability to always be Mark Wahlberg. If the movie is crap (The Happening) or amazing (The Departed), Mark will always be Mark. This movie is no different. At times it is Wahlberg at his best like the scenes with Saoirse Ronan. Then there are times when you simply can't see past the character and you wish you could because the film would only benefit from more sincerity. Saoirse Ronan is great in her portrayal of Susie Salmon--Wahlberg's daughter who is murdered and is stuck between the living and the dead. But the creepiness exudes from Stanley Tucci's character, and in the end, he truly carries the movie. Contrary to how I felt about the movie, I actually thoroughly enjoyed this book. The characters had depth, the story kept me intrigued, and the words flowed from sentence to sentence. As in most cases, the book is better than the movie and maybe that's because certain elements that are acceptable in novels just don't cut it in movies. I can find the middle of a book to be drawn out but still be OK with it if it ends nicely. The same can't always be said for movies. With movies, there is a carnal desire for more than just a nice ending. Unless you're one of those people who sees every rom-com out there. The only reason I chose to read this book is because it was recommended on Amazon. According to the site, if I loved Candide (and I absolutely did), then I would enjoy Utopia. The level of incorrectness was through the roof. I don't think I can begin to conceive of a novel that I've disliked more, especially since I was led to believe that Utopia was going to be a life-long friend. I can only find it quite ironic that a book with a title that boasts a feeling of great happiness left me far from happy and not even slightly amused. So...yeah. This book is the hipster's anthem. If you want to know the meaning of the word pretentious then I recommend you read this book. The author manages to hypothesize everything, overanalyze all that's simple, and make you hate the fact that you like cereal. But, even though I have my qualms with this book, I definitely had some very funny and entertaining moments over the 18 chapters. Two or three chapters stand out in a way that would make you copy the text and frame the words in your too-cool-for-school apartment. I understand that the author's musings are just that: his musings. I'm not expected to agree with his opinions, but I would have garnered more love for the book if it wasn't so into itself. But hey, I get it. I'm too uncool. Thanks for your comment. I'm glad you enjoyed my reviews. For Twilight: I just don't see how sparkling in direct sunlight compares to burning in it. Great reviews. Although I'd give the vampire movie a lower rating. Eli was good, I believe you misquoted me tho. I said the movie wasn't biblical, not that it wasn't about the bible! Whats next on the list? hey, i knew we weren't seeing denzel washington's version of "the passion of the christ," but the bible was definitely involved. hhmm...i can't think of anything good coming out in the near future. we may have to take a movie hiatus for a week or two. Nice reviews! I haven't seen any of the movies or read any of the books you talked about, but I'm considering "The Lovely Bones." I did see The Hurt Locker because of one of your posts and I loved it! i'm glad you liked the reviews. you should definitely read The Lovely Bones. can't wait to write another review or mention another movie that will entice you to spend some money on a good film. the lovely bones made me CRY! the book and/or the movie? the book is really great and the movie has some really good moments. stanley tucci is amazing in it.